[119 Pages Report] The ceramic tiles market was valued at USD 215.48 Billion in 2017 and is projected to reach USD 320.06 Billion by 2023, at a CAGR of 7.03% during the forecast period. The base year considered for the study is 2017 and the forecast period is from 2018 to 2023. The report aims at estimating the market size and future growth potential of the ceramic tiles market across different segments, namely, application, end-use sector, construction type, and region. It also provides detailed information regarding the major factors influencing the growth of the market (drivers, restraints, opportunities, and industry-specific challenges). The report further aims to study individual growth trends, future prospects, and contribution of various segments to the overall market. 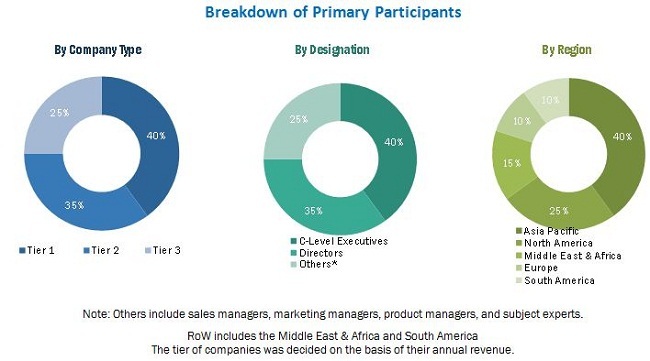 The study also analyzes the opportunities in the market for stakeholders and provides details of the competitive landscape for market leaders. It strategically profiles key players and comprehensively analyzes their core competencies. The market ecosystem includes various stakeholders involved in the supply chain of the ceramic tiles market starting from the procurement of raw materials to final product manufacturing. Post this, the marketing and sales of products take place, which is possible if an efficient distribution channel is developed. Finally, end products are made available to potential consumers. The market for ceramic tiles is led by major players such as Mohawk Industries (US), Kajaria Ceramics (India), China Ceramics (China), Siam Cement (Thailand), and Grupo Lamosa (Mexico). 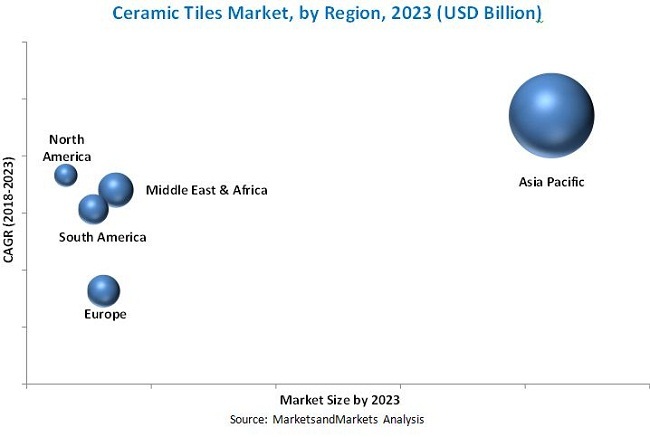 MarketsandMarkets projects that the ceramic tiles market will grow from USD 227.89 Billion in 2018 to USD 320.06 Billion by 2023, at an estimated CAGR of 7.03%. The segmentation for this report is based on application, construction type, end-use sector, and region. The factors contributing to the growth of the ceramic tiles market include the cost-effectiveness and the aesthetic appeal of these tiles and the growing trend toward interior decoration. The residential segment, by end-use sector, is projected to dominate the ceramics tiles market through the forecast period. The growing focus toward interior decoration and comfort, coupled with the rising disposable income of the population is expected to drive the demand for ceramic tiles in the residential sector. On the basis of application, the walls segment dominated the ceramic tiles market, in terms of value, in 2017. Owing to their characteristics such as resistant to water, fire, and moisture; cost-effectiveness; and high durability, ceramic tiles find widespread application in walls. Furthermore, other characteristics of ceramic tiles which make them suitable for walls include stain-resistance, fade-resistance, and odor-resistance. Ceramic tiles are used in various construction types such as in new construction and replacement & renovation activities. The new construction segment is projected to dominate the ceramic tiles market, in terms of value, through the forecast period. It is easier and more cost-efficient to install ceramic tiles in new constructions than in replacement & renovation activities. Asia Pacific dominated the market for ceramic tiles in 2017, in terms of value. The low manufacturing cost, increasing disposable income of the population, and rising construction activities drives the market for ceramic tiles in the region. In the region, China held the largest market share owing to the presence of the promising construction industry. The growth of the ceramic tiles market is hindered by the volatility in the prices of raw materials. Fluctuations in the prices of raw materials such as silica sand, kaolin, feldspar, and bentonite increase the capital involved in the entire manufacturing process of ceramic tiles. Rising costs and unexpected deviations in raw material prices destabilize the supply chain and render it difficult for manufacturers to sustain in the competitive ceramic tiles market. The global ceramic tiles market is dominated by players such as Mohawk Industries (US), Kajaria Ceramics (India), China Ceramics (China), Siam Cement (Thailand), and Grupo Lamosa (Mexico).